Finding an archery target that stands out among the rest can be difficult. After all, how much differentiation can there be when there are only 2D and 3D options to choose from? When it comes to choosing the best targets for bowhunters, isn’t it all the same? Not when it comes to the Solo Targets System®. We designed the Solo Targets System® with the bowhunters in mind and we’ve got the animal-shaped targets you’re looking for to get more efficient at “picking a spot” when that crucial shot opportunity presents to you. You will be amazed on how our 2D targets with HD graphics for elk, whitetail, mule deer, bear, rams, and many other species in our full line of game animals, will give you that three-dimensional look to a life-size target. We are the only system that gives you the best of both the 2D and 3D worlds. 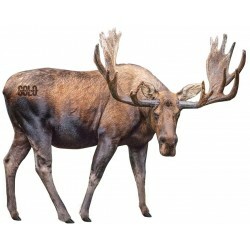 In the field of animal-shaped archery targets, companies have long endeavored to combine the benefits of 2D and 3D bow targets. That’s exactly what we accomplished through the patented Solo Targets System®. 2D targets are lighter, realistic looking, affordable, easily maneuverable, but they will require some type of backstop to stop the arrows. 3D targets will stop an arrow regardless of where you hit the target. For us, the best target to improve your bowhunting skills combines the 2D and 3D worlds. We believe that to become better in any skill, specially in sports, you don’t need to get “unearned rewards”, and that is how we designed our system. Read more about “unearned rewards” and our training philosophy here. Adjustable Bow Target Stand: Holds any foam block archery target of up to 80 lbs in weight or our 3D Vital Core. 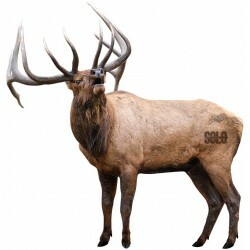 Solo Skins®: We use HD graphics to create realistic and life-sized animal targets. They have a guarantee on non-significant color fading for 10 months and are reinforced two inches around the vital target area. 3D Vital Core: you can use a small foam block archery target as a Vital Core or use our self-healing foam core if you are looking for a unique piece and want to really stand out. Since our Solo Targets System® will be only stopping an arrow if you are close to a vital area, you’ll be rewarded only when shooting close to a vital zone. Miss by a mile, however, and you’ll end up looking for your arrow. This increases your resilience, improves your aim and makes you a more ethical shooter. At Solo Targets®, we understand that the continued enjoyment of hunting is contingent on conservation efforts. We have created several partnerships with conservation organizations throughout North America, so every purchase you make supports these efforts while maintaining the love of the hunt for future generations. Our Solo Skins® and Adjustable Bow Target Stand are new and innovative archery target products unlike anything else in the bowhunting industry. When you opt for the Solo Targets System®, you’re literally opting for the best. Take your hunting game to the next level with Solo Targets®. THE SOLO TARGETS SYSTEM® IS AN INNOVATIVE PATENT PENDING SOLUTION FOR THE HUNTER’S EVERYDAY PRACTICE NEEDS. WITH OUR SYSTEM YOU HAVE THE OPPORTUNITY TO PRACTICE IN TROPHY LIFE SIZE ANIMALS IN YOUR BACKYARD OR AT YOUR FAVORITE PRACTICE SPOT INDOORS OR OUTDOORS. BOTH, ARCHERY AND RIFLE HUNTERS WILL HAVE A UNIQUE EXPERIENCE AND ENJOY PRACTICE TIME LIKE NEVER BEFORE.